Hidden away on the fringe of TTDI ( an upmarket suburb of KL ) lies the TTDI Park. A very popular park with the locals, but often completely unknown to new arrivals into the country! Family Day Out for March 2008 was meant to introduce this lovely well kept secret to ibu members who had never been here. This park has a running / walking / pram friendly ( !! ) track of about 2.5km. It loops around the top of the park via a suspension bridge. The park itself meanders around a pond, little covered sitting areas, a Tai Chi platform, a playground (slightly in a state of disrepair) but the creme de la creme of this park has to be the waterfall ( even though it is man-made! I got a shock the first time i saw it being 'switched' on and off! ). This waterfall leads into the long stream that runs down the centre of this park. 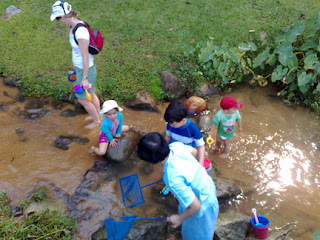 Full of tadpoles, mudskippers and other tiny fish, it is the main attraction for the little ones. Armed with a sieve, many can be seen desperately trying to catch something, anything to put into a jar! Today's outing garnered 9 families with 16 kids in total! 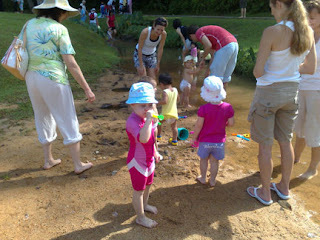 Starting out slowly, sitting on mats under a tree, many naturally gravitated towards the stream as it got warmer. Mums with babies too tiny to enjoy the stream stayed under the shade sipping lemonade and chatting. Dads were kept busy with kiddy cricket, bikes and balls. Most of us left about 11am when it started to just get a little bit too warm. My daughter had a great time and was ready for a nap as soon as we got home! All in all, a lovely morning out. If you didn't come this morning, do check it out for yourself. It's on Jalan Abang Haji Openg, if you are coming off the Penchala Link, its the 3rd left turn and just follow the road, it'll lead you straight to the park. Parking on weekends can be a bit difficult, but I always seem to get a spot. Try a week day morning one day - its' lovely! !